The assembly line at Toyota's Woodstock plant. Editor’s note: This story is part of the Automotive News 2018 Guide to Economic Development in the Global Auto Industry, which highlights the capabilities, opportunities and investment advantages of some of the world's most important auto-industry locations. Long viewed as a close partner of the U.S. auto industry, delivering tooling services, components and finished vehicles in step with factories in the United States, Ontario has struggled over the past decade. Now it is battling back - determined to rekindle local manufacturing. Canadian economic leaders viewed the situation as dire, since Ontario is the center of the country's automotive sector. Since 2006, 16 new vehicle assembly plants have opened in North America - not one of them in Canada. Officials now believe they can regain Canada's competitive edge and win new auto investment by partnering with companies on their investments. "During the global recession, our government made the investments necessary to keep our auto sector strong during that turbulent time," Steven Del Duca, former Minister of Economic Development and Growth, said in an interview prior to a June 7 election, during which he lost his seat. "Ten years later, thanks to these actions, Ontario has a thriving auto sector - but there remain important opportunities that call for continued government support and investment." The focus now shifts to the Progressive Conservative's majority government led by Doug Ford, who doesn't always believe in using tax money to help spur investment by big corporations. In May, the Canadian and Ontario governments said they will invest a combined $220 million to support Toyota Motor Corp., which has announced projects there valued at $1.4 billion. 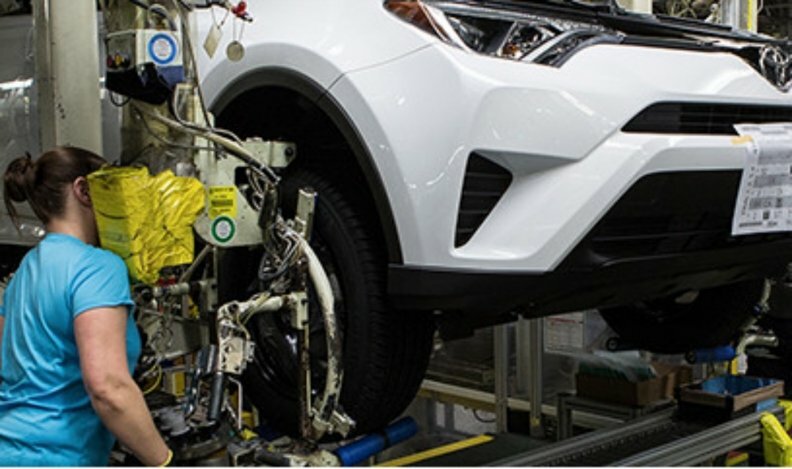 Toyota said it will upgrade its two Ontario assembly plants to build the next-generation RAV4, as well as incorporate R&D operations. Last year, Ford Motor Co. said it will invest $1.2 billion to establish a connected vehicle engineering research centre in Ottawa and upgrade factories across the province. The Canadian and Ontario governments committed a combined $204 million to the projects. At the beginning of this year, Linamar Corp. also said it will invest $500 million in Ontario. The Canadian government committed $49 million to the project and Ontario said it will provide a conditional grant of up to $50 million. Linamar will use the money to advance next-generation technology for electric and connected vehicles, creating an innovation center dedicated to machine learning and robotics with 1,500 jobs. While the U.S. auto industry made a furious comeback in the years following the industry crisis of 2008-2009, some remnants of it lingered on in Canada. Canada, and Ontario in particular, lost out on critical automotive investment in 2010 as North American vehicle sales and production began to rebound, industry veteran Ray Tanguay, now an automotive advisor to the government of Canada and Ontario, reported in his 2018 "Drive to Win" report about the outlook for Canada's auto industry. "In order for Canada to win investments we cannot just be competitive," Tanguay wrote in his report. "We need to be better than other jurisdictions south of the border." The Linamar investment is a significant one because it represents a solution for an emerging opportunity- the industry's need for more engineering firepower. Linamar operates 20 plants around Guelph, Ontario. Del Duca said the supplier is considered a "true, homegrown success story and a vital pillar of the local economy in the Guelph region." Linamar CEO Linda Hasenfratz said the decision to make a major investment in Ontario was an important move for the supplier. "We have very deep capabilities and deep bench strength here in terms of manufacturing and technology," Hasenfratz said. "We absolutely want to take advantage of the fantastic workforce and people we have here to launch business. We're dedicated, and always have been, to manufacturing in Ontario."